The single extant species of the Leptosomidae, the Courol or "Cuckoo-roller," Leptosomus discolor, is a carnivorous, forest-dwelling bird of Madagascar and the Comoro Islands. The phylogenetic affinities of this species are uncertain, but contrary to traditional classifications, it is not closely related to the Coraciidae (true rollers) and Brachypteraciidae (ground rollers) (see Chap. 3). Fossil stem group representatives from the lower and middle Eocene of Europe and North America show that Pan-Leptosomidae had a wide distribution over the Northern Hemisphere in the early Paleogene. These fossils were classified into the taxon Plesiocathartes, which was assigned to the Cathartidae by earlier authors (Gaillard 1908; Cracraft and Rich 1972). Five species of Plesiocathartes have been named: Plesiocathartes europaeus Gaillard, 1908 from an unknown horizon of the Quercy fissure fillings, P. geiselensis Mayr, 2002 from the Geisel Valley, P. kelleri Mayr, 2002 from Messel, as well as P. wyomingensis Weidig, 2006 and P. major Weidig, 2006 from the Green River Formation (Mayr 2002a, g; Mourer-Chauvire 2002; Weidig 2006). As yet unnamed species occur in the London Clay (Mayr 2002g). of the tibiotarsus (condyles very low and widely separated) and tarsometatarsus (hypotarsus with two furrows which are closed to canals in Leptosomus, trochlea for the second toe reaching farther distally than that for the fourth toe; Mayr 2002a, g). As in extant Leptosomidae, the postorbital processes of the skull are greatly elongated (Fig. 16.1; this feature was not mentioned in the original description and was pointed out to me by Nikita Zelenkov). 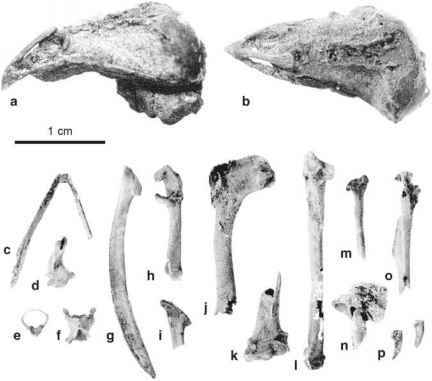 These Eocene stem group Leptosomidae differ from Leptosomus in the morphology of the furcula, which has a smaller omal extremity, is more widely U-shaped, and whose shafts are not strap-like as in the Courol. They are further distinguished from Leptosomus by their proportionally longer legs, details of the pelvis morphology (the pubis is not reduced in its midsection and the obturator foramen is caudally open), and by the absence of an accessory tarsometatarsal tro-chlea for the fourth toe, which indicates that the feet were anisodactyl and not semi-zygodactyl as in the extant Courol. 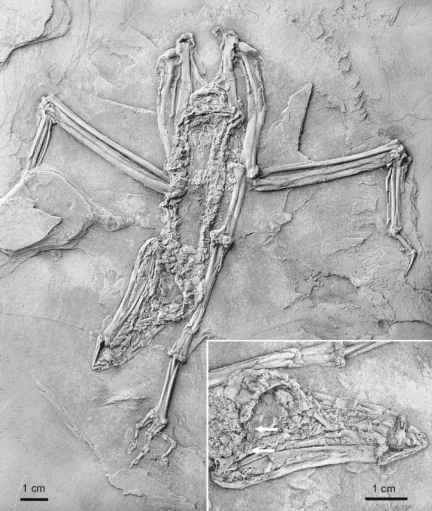 All stratigraphically ranked specimens of fossil stem group representatives of the Leptosomidae come from Eocene deposits, and these birds may have already disappeared from the Northern Hemisphere toward the Oligocene.